Ford announced Friday it would this year launch technology to automatically brake vehicles for pedestrians in the dark. The upgraded Pedestrian Detection system will be available first for the European version of the next-generation Ford Fiesta. Not long after, it’ll be an option for the 2018 Ford Mustang and F-150 in the U.S. The OEM tested the system at night in major European cities and on closed tracks with dummies. Ford car communications manager Dan Jones wrote in an email Monday that the technology automatically kicks in above about 3 mph and works at up to 50 mph during the day. The technology needs both the camera and radar to work, according to Jones. If the camera can’t “see” because a driver failed to activate the headlights, the solo radar isn’t enough of a fail-safe. The system checks whatever the camera sees against a database of “pedestrian shapes” to ensure it’s not mistakenly braking for items like trees or road signs off in the distance. The camera takes more than 30 frames per second, which as Ford notes is beyond the standard movie speed of 24 fps. “The video live-feed and viewing angle enables the system to pick out pedestrians, even in low-light conditions, illuminated only by the headlights,” Ford wrote. Note the reference to the angle, which reaffirms the need for collision and glass shops to precisely calibrate such modern technology within OEM tolerances. The system can’t detect deer — which really could have affected the collision repair industry. That said, technology housed in the bumper and windshield is going to impact auto body shops and insurers to some degree by raising severity. 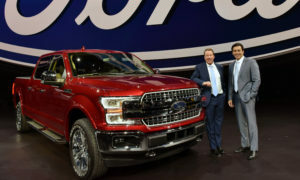 The Pedestrian Detection technology will first warn the driver before making the executive decision to brake the Mustang, F-150 or Fiesta itself. Night blindness and the possibility of a collision are among the top fears of nighttime drivers, according to a poll sponsored by Ford. The National Highway Traffic Safety Administration found that 75 percent of pedestrian-vehicle collisions happened at night, according to Ford. In Europe, the European Road Safety Observatory reported in 2016 that half of the pedestrians killed on the roads were struck at night, Ford wrote.